The Summer of "Love It"
Finding your inner-Woodstock, and we don't mean through tie-dye. 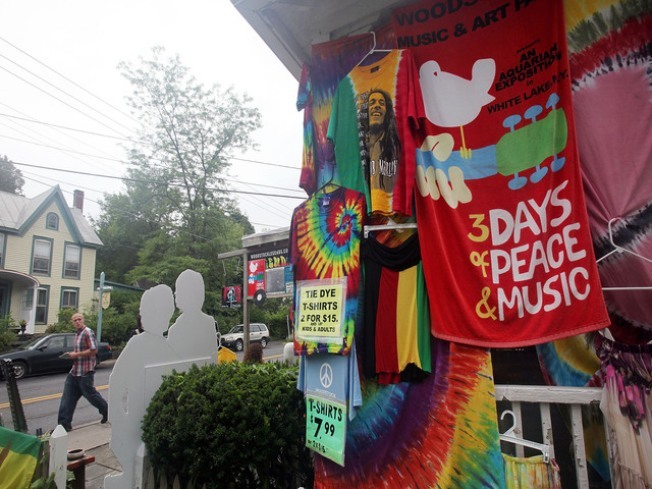 A souvenir shop sells goods as the 40th anniversary of the Woodstock music festival approaches August 13, 2009 in Woodstock, New York. It's the 40th anniversary of the Aquarian Exposition known as Woodstock, and while many have attempted to revive and replicate this monumental event, very few have succeeded. Same goes for the fashion, Sienna Miller's Boho Chic phase and Rachel Zoe's haute hippie influence have attempted to bring the carefree fashion festival go-er's exhibited 40 years ago, but it's not quite the same. But hey, who says we can't try anyway? EXCESS BAGGAGE: JJ Winters is the fav of many Hollywood it gals du jour, but their bags are more than just arm candy. They come with plenty of fringe, Western medallions and the festival-safe, cross-body strap. JJ's suede totes come in both earthy and flirty colors, depending in what kind of a statement you're hoping to make. We like the fringed saddle bag in violet and turquoise, both offering a pop against Fall's muted jewel color palette. AN IN-VEST-MENT PIECE: Here in New England we're always looking for ways to convert our plethora of summer dresses to four-season-friendly frocks. Forever 21's suede Boho Fringed Vest is ideal for this and would have made our Woodstock relatives proud, layered over delicate silk blouses or fall's ribbed and mini-sweater dresses. It comes in black or brown, such a steal for $24.80! Visit Forever 21 in Manchester or order online. HEY JOE: Free People's Jacquard Motorcycle Coat is made of taupe, mustard and chocolate paisley velvet and falls past the hip but maintains traditional biker embellishments, like an adjustable belt and wide panel zipper. This psychedelic number would have made Jimi proud. Hey, he might have even asked to borrow it! Cigarette burns and grass stains not included. Find at Free People in Greenwich for $188. THESE BOOTS WERE MADE FOR WALKING: Although bare was the most popular footwear of choice in the muddy fields, for the sake of sanitation and style, we would opt for Steve Madden's Vestedd ankle-height cowboy boots. Made of crackled copper leather with a worn wooden short-stack heel and a chunky inner-ankle zipper for modern flair. Equally perfect for trekking through swampy fields and hiking up Fifth Ave. Find at Steve Madden at the Westfarms mall in Farmington.